this meal comes together pretty quickly - well in my book anyway. i love any combination of sweet & savory - and this dish certainly delivers. 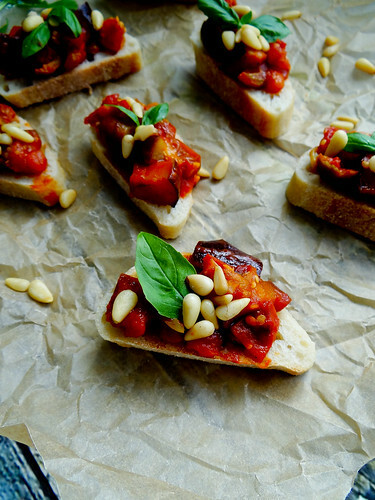 traditionally caponata is served at room temp as an appetizer. 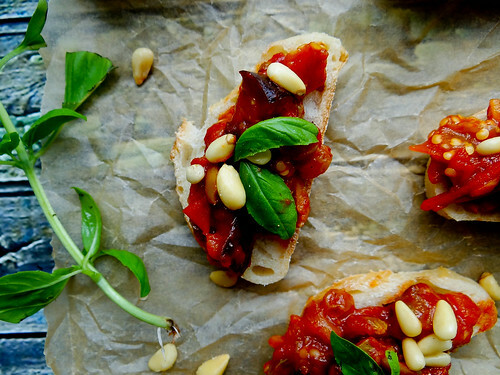 i love the freshness the basil and pine nuts add to the final dish. my sister who isn't a big fan of eggplant enjoyed this little nibble just before lunch. the flavors work so well together you don't even remember the eggplant - well at least i didn't notice an overwhelming presence of eggplant in this dish and i have eaten it for 2 straight weeks with another day's worth stashed in the freezer, only to come out when a quick and easy weeknight meal is called for. for all of you eggplant haters, this dish may very well convert you into a eggplant lover...or at the very least and eggplant "liker". heat oil in a large saute pan over medium/high heat - add eggplant and fry tossing occasionally (about 5 minutes) until browned - transfer eggplant to a bowl and set aside. in the same pan, add tomatoes (fresh & canned), garlic & season with salt & pepper - cook for about 10 minutes or until fresh tomatoes begin to breakdown and tomatoes begin to thicken. add cider vinegar, olives, raisins & sweetener. cook for an additional 10 minutes until mixture thickens. stir in chocolate & reserved eggplant and cook an additional 5-10 minutes until desired thickness has been achieved. 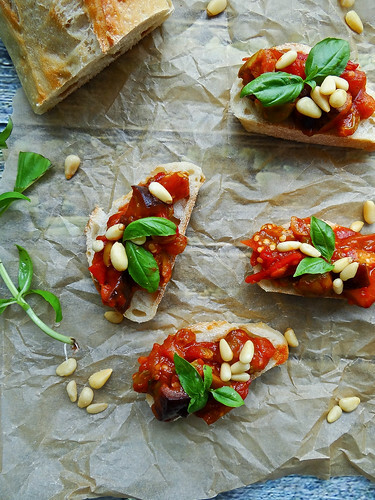 to serve - toss with pasta of choice or serve over crostini, adding basil and pine nuts just before serving. can be enjoyed at room temp or warm. I'm pretty sure it's a sin that I've only eaten eggplant once since it's been available. But! This looks delicious. 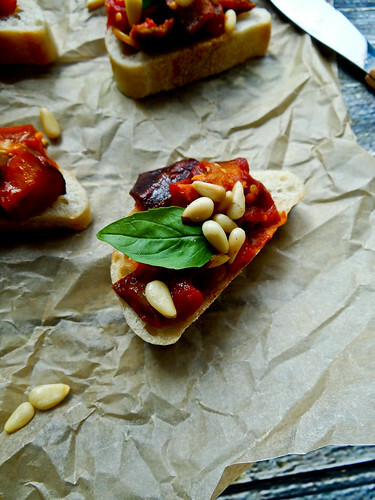 Must get my hands on an eggplant and serve this over oiled pasta noodles. 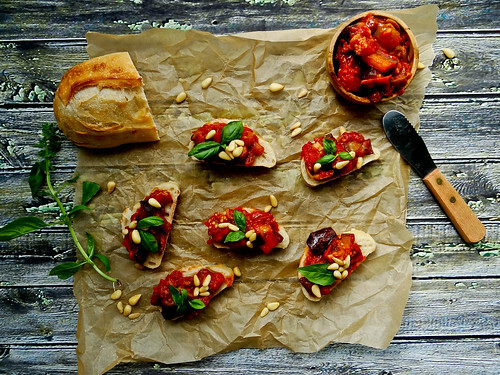 the caponata looks delicious!.. i should try it for hubbs. he is quite picky about eggplants. Justin who strongly dislikes eggplant unless it is fried even liked this! ....I have a feeling I will not be enjoying eggplant for a while, I have never eaten so much eggplant as I have this month! I totally feel the same way about eggplant, but the more i experiment the more ways i find how to enjoy it! I love eggplants. but I always seem to cook it too much..or not enough. Your recipe looks delicious! I think caitlin is right. I would have a visit also ! 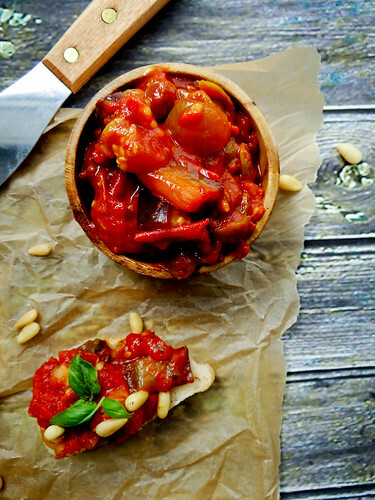 And probably try this delicious caponata! 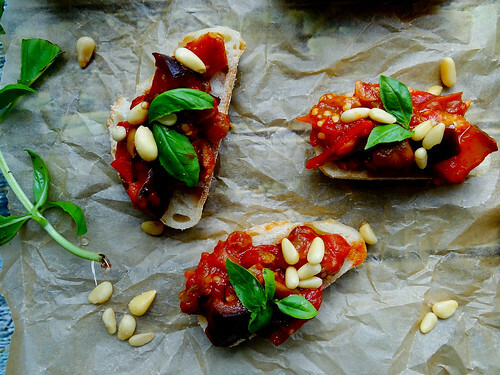 This caponata sounds excellent--and definitely perfect for the early fall eggplant bounty. 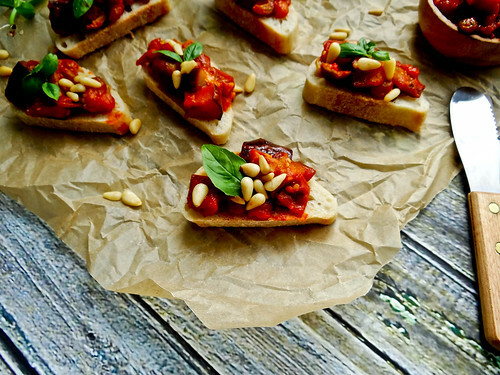 :) I might try this with some toasted walnuts in place of the crazily expensive pine nuts. Toasted walnuts would be amazing! This sounds so crazy. 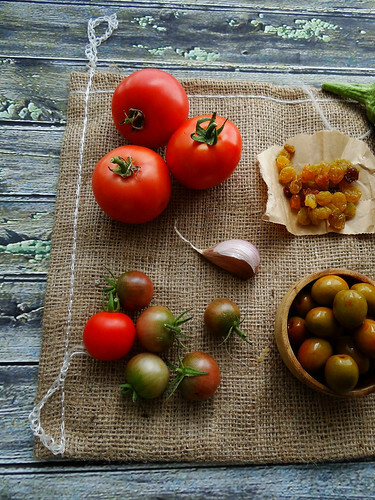 I have never heard of a caponata. I have a few eggplants from the garden, so maybe I will give this a shot! I was that way for the longest time, only ever having it once in a while- I actaully think before this year I only ever cooked eggplant once! Wow this is so creative! 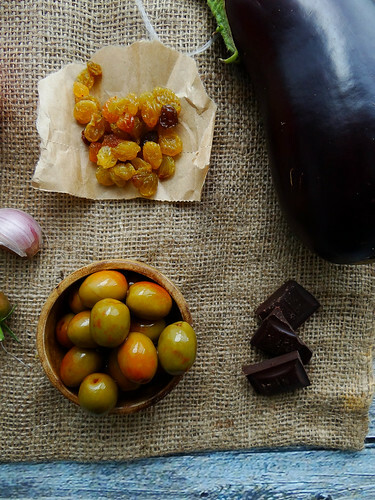 Chocolate with eggplant, how cool! I almost never make eggplant but you are really making me want to! Thanks Gabby - let me know if you give this recipe a try and what you thought! That means so much coming from you Shira! Thanks for stopping by - I had so much fun "travelling" with you to Paris! I'm kind of neutral about eggplant too, but these photos are making me crave a warm pasta dish with eggplant right now...I would probably eat this over pasta with a side of the crostini too! I'm not sure what to think of that chocolate - it sounds odd, but I would trust you that it works! ...i am totally in the same boat- Justin is not a fan of eggplant so more for me!....I can't say the same for my cakes though - I literally have to fight him off of those so I can take a pic! Eggplant is pretty much the only thing Chris isn't all that excited about, so I hardly ever use it. 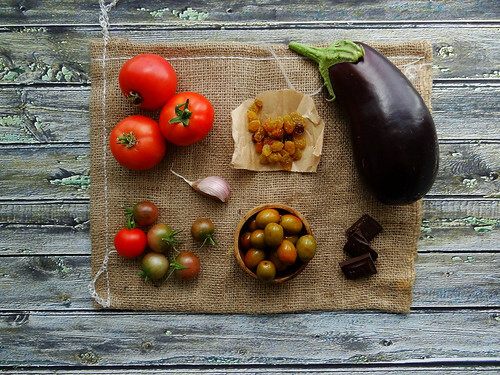 I do love a good caponata, though, and I've never had one with chocolate (Pure Genius!!!). I might need to sneak this one in sometime soon (Shhh, don't tell Chris!). You should definitely sneak this in at some point! I was on the fence forever about eggplant - but once I found ways to enjoy it other than parm form I really have been loving it!